Melt the butter in a bowl over a small saucepan of boiling water. Whilst the butter is melting, place 300g of Digestives in a sandwich bag and crush with a rolling pin or use a food processor until the biscuits are in a small crumb. Place biscuits in a mixing bowl, pour over the melted butter and mix together until well combined. Spoon the mixture into a 8" (20cm) lined springform tin and press down firmly and evenly. Place in the fridge whilst you make the cheesecake filling. Melt the Kinder Chocolate in a bowl over a small saucepan of boiling water - stir regularly. Leave to cool whilst you make the rest of the filling. With an electric hand whisk or KitchenAid, whisk the Philadelphia, icing sugar and vanilla extract until combined. Pour in the melted, slightly cooled Kinder Chocolate and whisk again until it's smooth and blended through. Pour in the liquid (no need to whip) double cream and continue to whisk the mixture until well combined. You'll know it's ready when it can hold it's form and be an almost mousse like consistency. 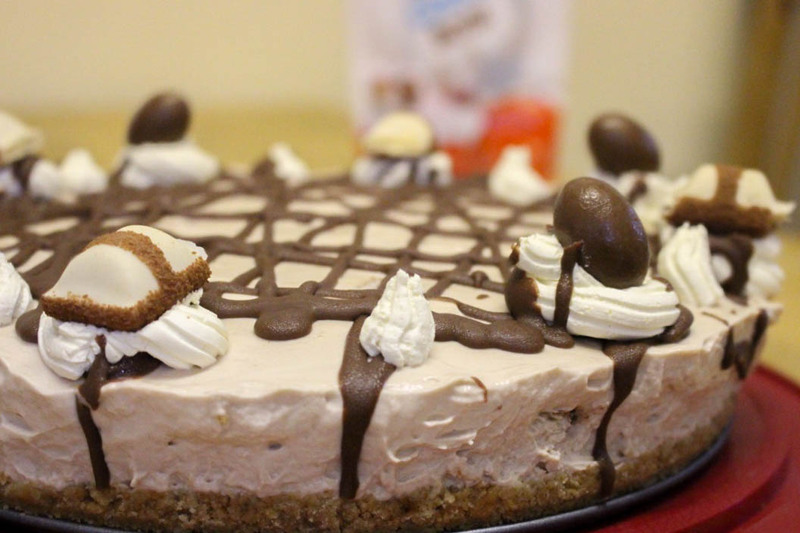 At this point, you could fold through Kinder Chocolate pieces or Kinder Bueno pieces, but I find that Kinder Bueno goes rather soggy within the cheesecake. Spoon the mixture onto the biscuit base, ensuring that it is spread evenly, cover with clingfilm and place in the fridge, preferably overnight so that you won't risk the cheesecake not setting and being too sloppy. Remove the cheesecake from the fridge and the springform tin and decorate, if desired. To decorate my cheesecake, I melted 50g of milk chocolate, placed it in a piping bag and roughly drizzled it over the cheesecake. I then whipped some double cream (about 20ml) and piped it around the edge of the cheesecake. Going the other direction, I drizzled some more chocolate over the cheesecake. 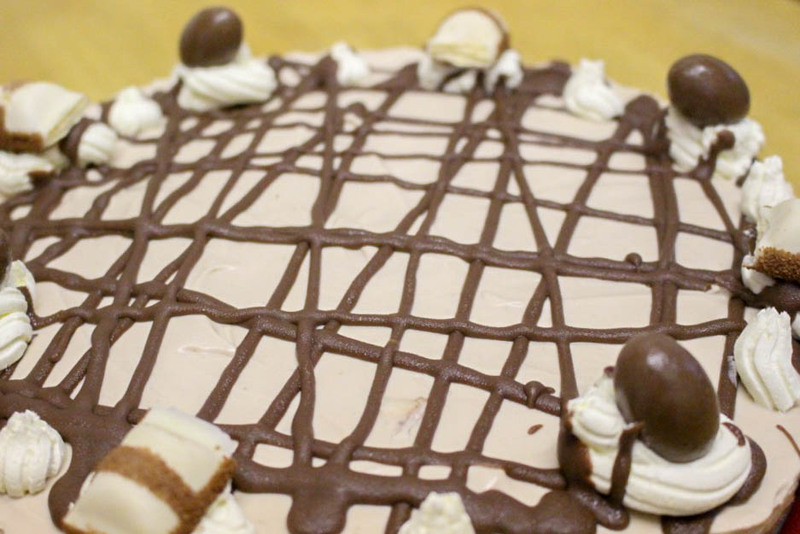 I then placed Kinder Bueno and Kinder Choco-Bons on top of the larger blobs of cream. However, feel free to be creative and decorate your cheesecake in whatever way you wish. It's safe to say that this cheesecake went down a treat and it's definitely put me in the mood to start Autumnal baking soon. I'm thinking blackberry and apple crumble, toffee apple cake and cinnamon swirls so far. Although, I'm looking for more ideas, so I'd love to know what you like to bake around Autumn time. 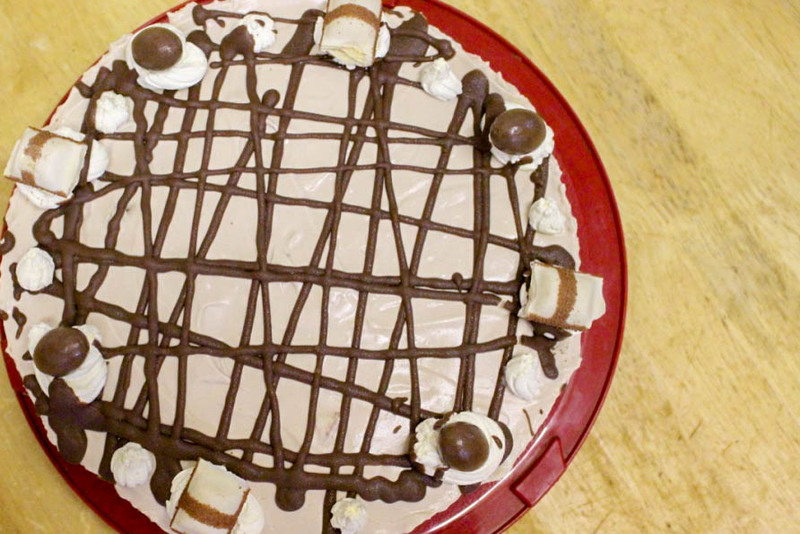 Would you make this Kinder Cheesecake? Let me know in the comments! This is such an amazing idea, I 10000% need to try this for myself it looks perfect! This looks so so yummy! I'll be giving the recipe a go!